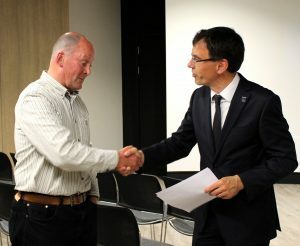 Last week we held a thank you celebration for our team of volunteers. Some of them have finished their time with us and others are continuing. (There will be new opportunities for volunteers in the autumn). 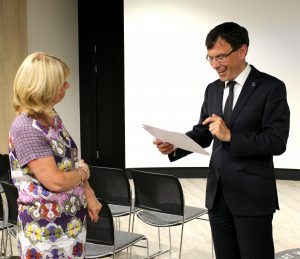 Deputy Vice-Chancellor Professor Tim Thornton presented each volunteer who was able to attend with a certificate of their volunteering so far – between the 9 people who were able to be there they’ve clocked up 1,800 hours in a year – or equivalent to 0.6 of a full-time post! A really amazing contribution for which we’re very grateful, and look forward to continuing to work with these key members of our team. 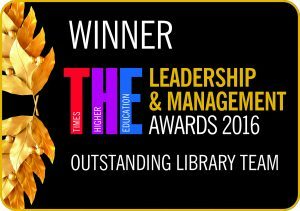 London, 23 June 2016: University of Huddersfield won the Outstanding Library team award last night, at the Times Higher Education Leadership and Management Awards 2016. The awards, now in their eighth year recognise outstanding leadership and management in the UK’s higher education institutions. Heritage Quay, the University of Huddersfield’s official archive, opened in October 2014. From the start, it was designed to offer “a truly interactive service where collections become a catalyst for creativity and are a living archive, offering a lively interface between our audiences and the academic community”. The result is unique among archives in any sector in its use of immersive technology, including an IMAX-style 7 metre video wall to allow visitors to animate and interact with the heritage collections. The wide-ranging programme of events and outreach across Yorkshire and beyond are also highly unusual within UK higher education. These goals were achieved through the identification of thematic communities of interest, and extensive consultation with partners in the public sector and voluntary organisations, as well as the owners of the principal collections, such as the Rugby Football League and Sound and Music (the national charity for new music). 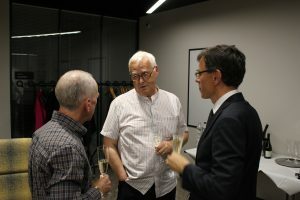 As a result of this, the university created a four-year activity plan and an interpretation strategy, which also underpinned the overall development of the building. 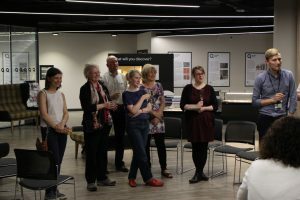 The judges praised Huddersfield’s “amazing new knowledge hub” as “a great example of how to transform valuable heritage collections into an interactive and engaging interdisciplinary resource”. 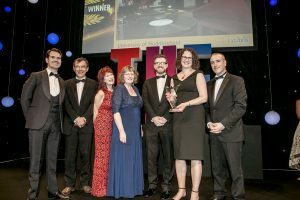 Winners attended a black-tie event at the Grosvenor House Hotel, London, hosted by actor and comedian Jimmy Carr, where over 1,000 guests gathered to celebrate outstanding performance in the competitive world of UK higher education. These animations were produced as part of Heritage Quay’s adult learning programme across workshops in June 2016. LEADING figures from the National Archives, based at Kew, came to the University of Huddersfield to bestow one of the most sought-after awards in the sector. The University is the home of Heritage Quay, a £1.6 million, technologically-advanced archives centre that is highly accessible to the general public and specialist researchers alike. Now, it has officially been declared an Accredited Archive Service. This is a distinction awarded by a panel including the National Archives and the Archives and Records Association. The certificate states that the aim is to “ensure the long-term collection, preservation and accessibility of our archive heritage”. Accreditation is a UK quality standard “which recognises good performance in all areas of archive service delivery”. 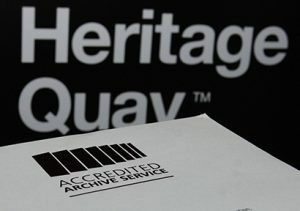 It was announced earlier this year that Heritage Quay – after an exhaustive application and validation process – had been granted Accredited Archive Service status. 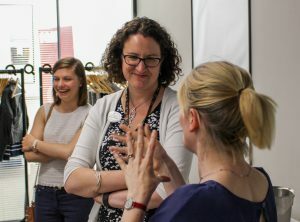 The award has now formally been made at a ceremony attended by Caroline Ottaway-Searle, who is Director of Public Engagement at the National Archives, and Melinda Haunton, their Programme Manager for Accreditation. 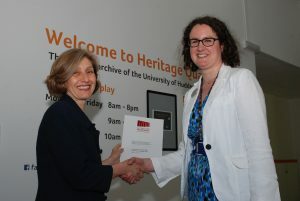 ‌Members of the Heritage Quay team was present to receive the award, alongside University of Huddersfield Archivist and Records Manager Sarah Wickham, Director of Computing and Library Services Sue White and Deputy Vice-Chancellor Professor Tim Thornton. The nine-strong team at Heritage Quay worked on the substantial submission that was required to apply for accreditation. It appraised factors such as repository standards, the range of public services offered, the policies and procedures in place for managing and cataloguing collections, and the outreach activities taking place amongst a wide range of audiences. After the document was completed, Accreditation Assessors from across the archives sector visited Heritage Quay to validate the submission. Out of some 2000 archives in the UK, Accredited status has so far been awarded to 45. The University of Huddersfield joins a list that includes the National Archives themselves, plus London Metropolitan Archives, Lancashire Archives, the National Records of Scotland, the Churchill Archives Centre and the National Library of Wales. Heritage Quay barcode When it announced that Heritage Quay had joined the list, the Accreditation Panel cited “the recent years of hugely impressive development to this archive service, and the overall uplifting and positive impression of the service in this application”. It added that “outputs of recent years included a very sound policy basis for the service to develop in future, in addition to the significant achievements supported by a major grant award”. Find out about what the volunteers have been working on and what they enjoy about volunteering with us. Whilst we have a vacancy in the team, we regret that the research room will be closed on Mondays during May, June and July. and on the third Saturday of the month 0930-1300. Our enquiry and other services will run as normal. We are seeking an experienced assistant to work in the University Archives in its award-winning facility Heritage Quay. Duties will include day-to-day care of the collections, accessioning and listing collections in Calm (Archives Management software), supervising the reading room and answering enquiries. The post is for two and half days per week to include Mondays and Tuesdays with occasional evening and weekend work (one evening every other month and one Saturday morning every other month). You should have 2 A Levels, at least 5 GCSEs at Grade C or above, including Maths and English (or equivalent qualifications) and a basic computing qualification such as CLAIT or ECDL. An appropriate Library Assistant Certificate, or equivalent, would be desirable. Informal enquiries are welcome to Lindsay Ince (Assistant Archivist and Records Manager) on (01484) 473168. If you are currently registered as a full-time student at the University please note that you may only apply for part-time jobs of 15 hours or less per week. For more information, please download the recruitment pack.